In the true tradition of European trompe l'oeil furniture. What initially appears to be a bookshelf slides apart to reveal a library table with two tone-on-tone cushioned barrel chairs on casters and hidden compartments for your coveted first editions! 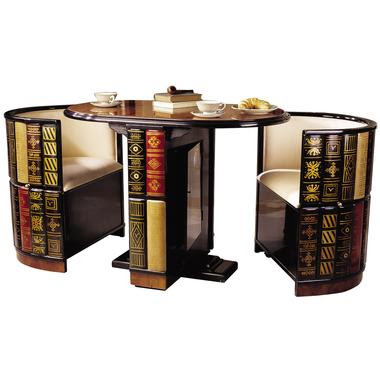 The extraordinary hand-painted, lacquer-finished top is faux burled wood with black ebony trim. Whether you choose it for its sleek, space-saving design or its elegant and novel style, this wooden heirloom will garner compliments in home or office.